Today is a busy day for announcements. 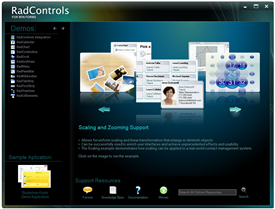 Hot on the heals of the official release of RadControls for Silverlight 1.0, Telerik is pleased to present the beta of the RadControls for WinForms Q2 2007. Out almost 3 weeks ahead of the official September 17th release, this beta should allow plenty of time for you to submit your feedback and suggestions for improvement. As was the case with the WinForms SP2 release a couple of months ago, Q2 2007 will focus mainly on improving the performance of the RadControls. Since their introduction, performance has been the number one issue with WinForms developers and thus our number one priority. Our devs have worked hard on improving that situation and I think you'll be very pleased with what you find in Q2. Even though performance was the main focus of Q2, there are some new controls for you to play with. RadChart for WinForms received a major update in this release and a brand new control- RadCalendar- has been added to the suite. RadCalendar delivers the same rich "WPF-like" visuals that you've come to expect from Telerik's WinForm controls and an API that is similar to the ASP.NET version. If you're using the rigid standard WinForms calendar control, you definitely need to check out RadCalendar for WinForms. Help us make Q2 a great release by downloading the beta today and letting us know what you think.